This issue wraps up the opening storyline for writer Brian Michael Bendis' run on the adventures of Superman. As expected, the Man of Steel mini-series has taken some liberties with Clark's backstory. 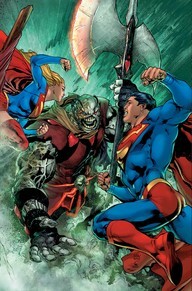 So we meet the alien who may have destroyed Krypton - and unless Superman and Supergirl can stop him (it? ), Earth faces the same fate! We also discover the reasons behind the surprising disappearance of Lois and young Jon - and the unexpected return of a character thought to have died long ago. It's an interesting new chapter in the life of Superman, with lots of action along the way. So far, it's been very good. I'm especially happy to see the return of "smart" Superman - the hero works best when he isn't just depending on his muscles to solve problems. Like politics, there are basically two approaches to a new campaign: you can promise a "fresh start" or a "return to greatness!" Bendis seems to be having it both ways... so far!